Canyonlands National Park in Utah encompasses some of the most remote and rugged terrain in the continental United States. The topography is so irregular that the Park’s three main districts—Island in the Sky, the Needles, and the Maze—are not accessible from one another by paved roads. 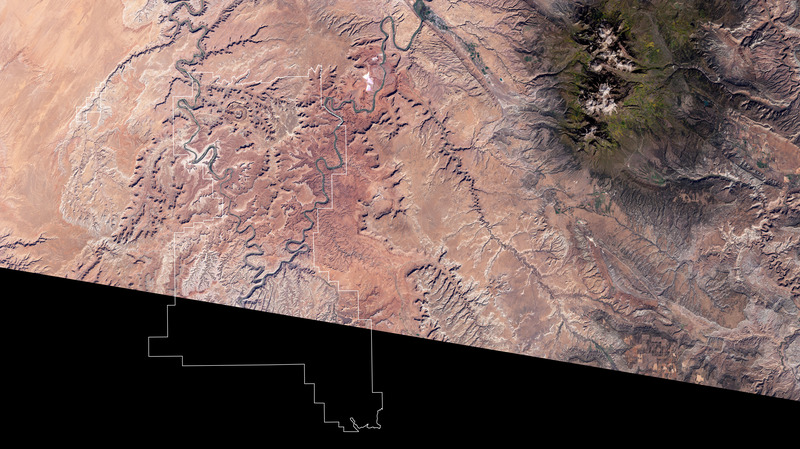 This true-color satellite image from the Enhanced Thematic Mapper plus (ETM+) sensor on the Landsat-7 satellite shows the Island in the Sky, a large mesa bordered by the Green and Colorado Rivers. 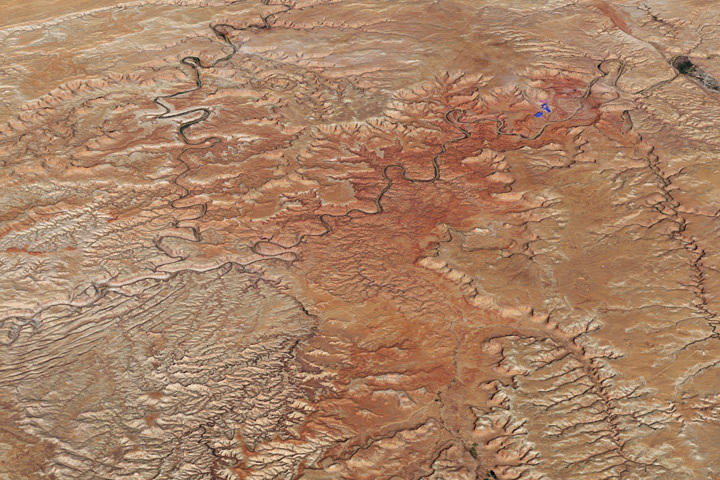 Vegetation is sparse in the Southwest’s arid climate, revealing a landscape of brightly-colored rock. 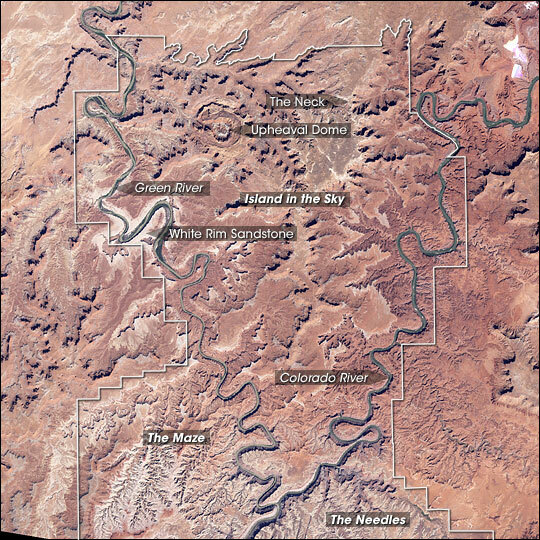 The Island in the Sky is separated from the rest of the Colorado Plateau by a narrow strip of land named “the Neck.” The relatively flat mesa rises 600 meters (2,000 feet) above the Green River to the west and the Colorado River to the east. Tributaries to these major rivers have cut steep-walled canyons that lead from the top of the Island in the Sky mesa to river level, exposing stacked layers of sedimentary rock. These rock layers record roughly 150 million years of the region’s geologic history, from the Navajo Sandstone that caps portions of the mesa to the Honkaer Trail Formation limestones that lie at river level. Relatively hard rock layers such as the White Rim Sandstone form flat benches rimmed by vertical cliffs, while softer rocks erode into shallower slopes. 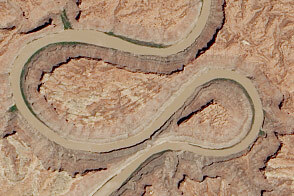 The landscapes of Canyonlands continue to change, as rain and wind erode exposed rock. 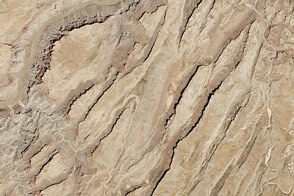 More unusual geologic processes also shape the land. Upheaval Dome is a distinct, circular feature near the northern boundary of the park. Geologists continue to argue about the formation of the dome: some evidence suggests it was formed by a meteorite impact, while other data indicate it was shaped by the movement of salt layers deep underground. 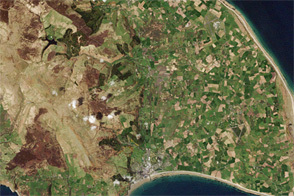 NASA image by Robert Simmon, based on data from the Global Land Cover Facility. This park in Utah encompasses some of the most remote and rugged terrain in the continental United States.